The Scottish government has issued a warning to farmers after the bluetongue virus was detected in cattle imported from France. 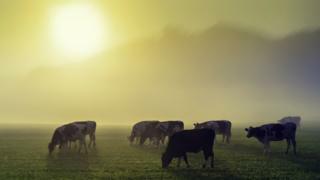 The virus was found in cattle in Dumfries. The government said the disease was being contained by the imposition of movement restrictions and there was no threat to human health. The last outbreak in the UK, happened in the south of England in 2007 and did not spread to Scotland. The agency is working with the livestock keepers affected to ensure swift action is taken to prevent spread of the disease, with movement restrictions at affected premises, surveillance and humane culling of animals where necessary. Chief Veterinary Officer for Scotland, Sheila Voas, said: "Bluetongue does not pose a threat to human health or food safety, but can have a severe impact on affected farms. "A total of 10 animals were imported from the same assembly centre in France - an area where multiple cases of bluetongue have been confirmed in recent times - and we are working closely with affected farms and stakeholders to contain the virus. "While I am pleased with our robust disease surveillance procedures have worked, the identification offers a timely reminder to farmers for the need to remain vigilant and of the risks of importing animals from disease-affected areas into their herds." Bluetongue is spread by insects and affects animals such as cattle, goats, deer and sheep. It does not affect humans.